Whist visiting Edinburgh I was recommended by the travel agent to eat out here. Whilst it is a small restaurant the atmosphere was relaxing and the décor was wonderful. Staff were pleasant and the service was great. 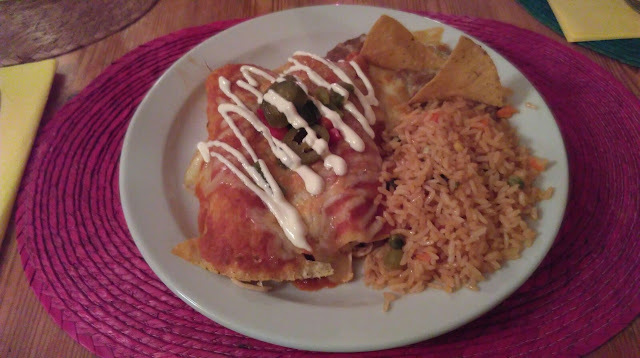 I had the Chicken Enchilada which tasted delicious, served with rice and refried beans- this tasted like a traditional homemade Mexican meal. Although the prices were quite steep the portion sizes were big! For dessert I tried the warm chocolate fudge cake served with vanilla flavoured ice cream. Not being s great fan of fudge, it did not taste very rich which I liked. Overall very pleased and if you’re looking for somewhere cosy to eat I would recommend!